Accepting Mesa Union PFO Board Nominations Now! WE NEED YOU - HELP KEEP MESA THRIVING! 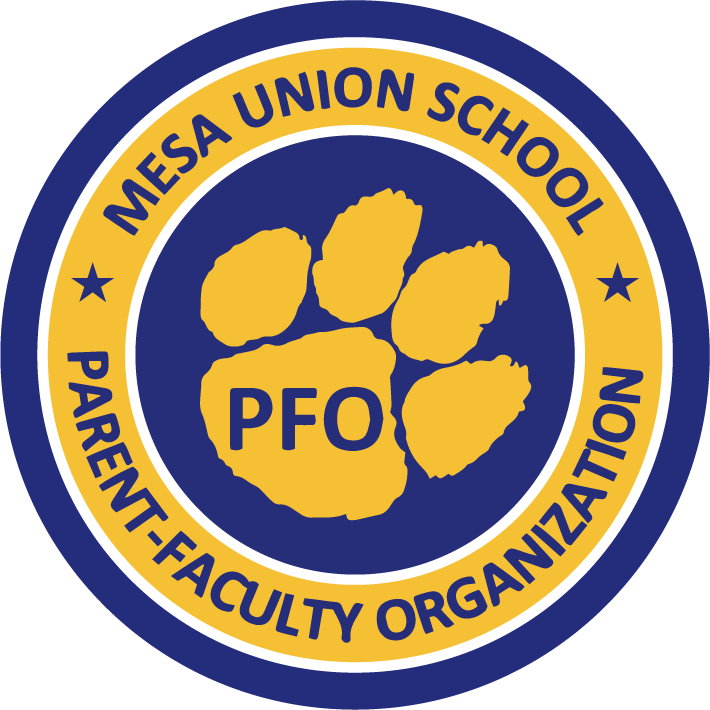 Mesa Union School PFO is now accepting board officer nominations for the next 2019-2020 school year. Term is effective July 1, 2019. Elections are held at the May Annual Membership meeting. Put together a team and make a difference! Email nominations@mesapfo.org to submit your name or nominate someone for consideration. See rules regarding eligibility in our Bylaws & Standing Rules. Nominate yourself or someone else. All positions can be shared as "Co-". 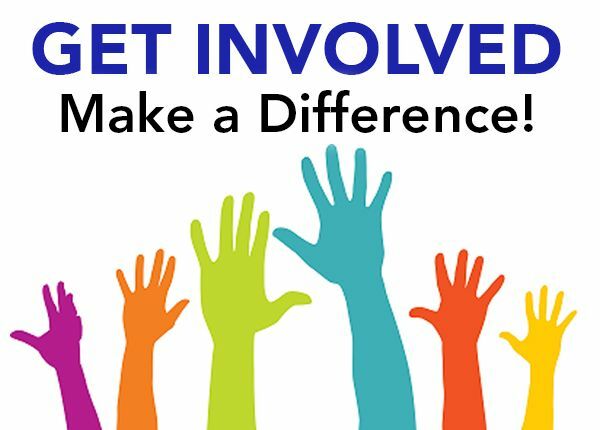 Nominations must be received by Friday March 15, 2019 and will be voted on at the PFO Annual Meeting Friday May 3, 2019. Nominees will be contacted to ensure their interest and membership status verified before their name is placed on the ballot. The Board recruits and appoint chairpersons: Audit, Budget & Allocations, Fundraising, Hospitality, Membership, Nominating/Elections, Programs, Carnival, Mesa Challenge, Book Fair, Athletics, Mesa Cares, Bylaws, etc. Chairpersons recruit program and fundraising coordinators. Any questions? Contact the Elections/Nominations Chair Maribel Carino-Alvarez (Mesa Librarian) or any current PFO Board Officer or email above. Mesa Union PFO is a nonprofit public 501c(3) charity. It runs like a nonprofit corporation with similar governance and reporting requirements. PFO operates on approximately a $100,000+ budget each year dependent on fundraising goals met. PFO provides for the general welfare of the Mesa's students and families with educational enhancement and school connectedness programs such as field trips, teacher room funds, special projects/programs, athletics funding, family nights, Carnival, hospitality, etc. Please note that if there is no Board elected, programs will be suspended. An interim Board may be empaneled to provide administrative oversight of business functions until a new Board is installed. Chairs and Coordinators are approved and appointed by the PFO President/Board. 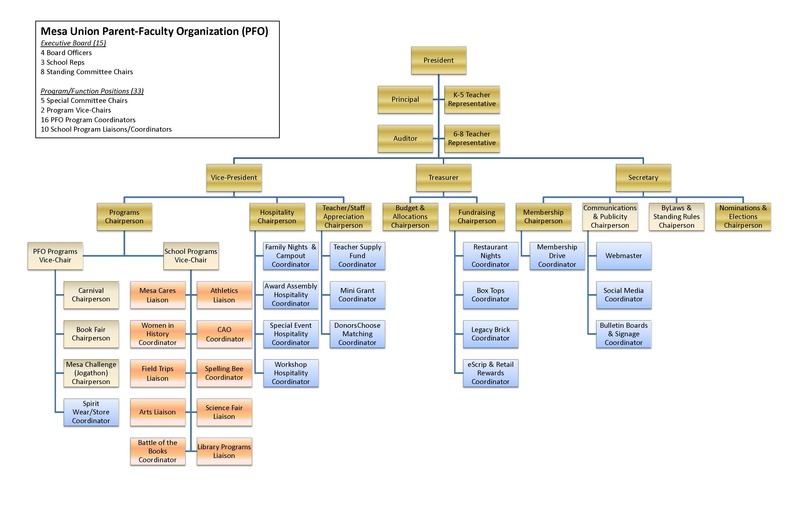 Click on the link to "PFO Board, Committee Chairs & Program Coordinators" for list of positions. It is the intent of the PFO Board to establish all chairs and coordinators in June of the prior school year. Thank you to those Chairs and Coordinators that will be continuing.